author Robert Brault once wrote. I came into this world as the nephew of Gregg Godfrey, the man who brought Nitro Circus to life with Travis Pastrana and who has spent his entire life mastering the art of reckless fun. Safe to say, I was born into chaos, and by definition I was destined to be pronounced insane. By the time I could walk, I was also thrown onto (and off of) bicycles, motorcycles, scooters—anything dangerous with wheels. 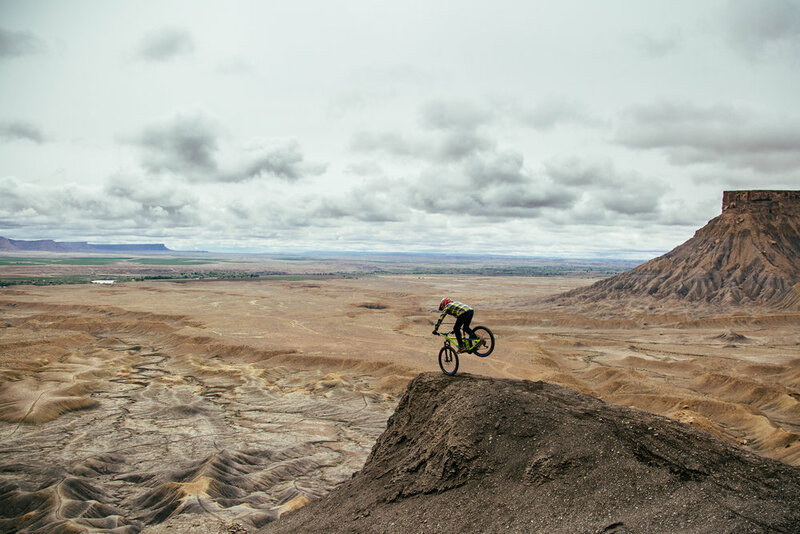 As I grew up, I gravitated toward downhill mountain biking, but motorcycling was in my blood. For most of my life, I’ve dreamt of a way to connect the two worlds. 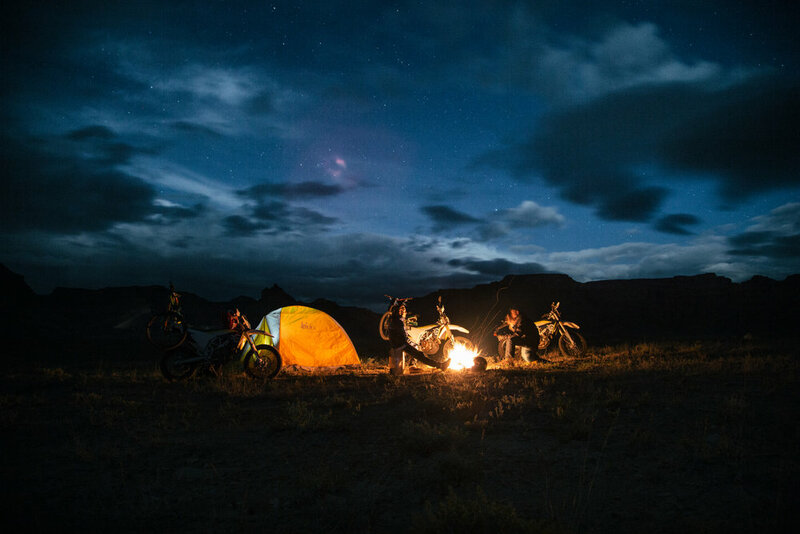 It would become my mission—an obsession to find space where none exists, to create an experience that melds the feeling of motorcycling with the deep natural connection of mountain biking. Determined to combine these factions, we conceptualized a rack-mounted MTB on the back of a motorcycle. The convenience of instant overland shuttle capabilities gave way to the realization that we could get deeper into the forests than ever possible in the search for the sacred, untouched backcountry lines that existed in our minds. Our first obstacle was to find the right motorcycle—the perfect mix between dirt and street with go-anywhere capability. While vetting virtually every model in current production, we discovered our timing was serendipitous: Husqvarna had just released the all-new 701 Enduro, and at first glance, we knew we had finally found the ultimate machine for the job. We scoured the web for bike-rack designs, off-road mounts, and anything we might be able to modify or pull inspiration from to make our own moto mount. After hours of combing for ideas, it became clear that the only real way to find out if it would actually work or not was to just go for it and make something. We were flying blind on this one. My first call was to Uncle John. (I know—really getting lucky here in the uncle department.) John is an engineer, specializing in automated conveyor systems, but he has watched us ride from the beginning and understood our idea perfectly. What would likely take me two full weeks to create, he helped us design and build in two days: a fully functional aluminum frame with space to strap all our camping gear and bags. Prototype in hand, Husky 701s in the garage, this concept turned into a mind-blowing reality. Drawing a line on a digital map of where we wanted to go was simple. But getting there was a whole ’nother story. We skipped any sort of testing or R&D, opting to head straight to the backcountry and into the unknown. It was questionable whether our setup would hold up to the challenges ahead, but our lack of foresight made these questions burn less in the midst of impulsive, adrenaline-fueled action. I was confident that we had the right crew to make this trip successful. Joining me on this journey was my older brother, Josh Roberts, renowned photographer Aaron Brimhall, and talented filmmaker Kollyn Lund. Thankfully, these boys are also talented motorcycle riders—a trip prerequisite for sure —and on balance, there’s nobody else I would want joining me on this trip. There was no trailering to a drop point on this mission; we were rolling out straight from the garage. As we geared up and made a few last-minute adjustments to the bikes, we eyeballed the setup and were off—all four of us, packed to the brim with bags, cameras, tents, and mountain bikes. If there is a trial by fire in this world of chaos we call Spaceship Earth, we had just approached the bench. We rode 75 miles from Salt Lake City and stopped for fuel at the mouth of Spanish Fork Canyon. Towering black clouds soon rose over the horizon, gaining momentum and swallowing the canyon behind us. Sunshine ahead, danger behind, our blissful cruise became a flat-out run to escape a wall of water and a 40-degree drop in temperature. Thirty miles deep into the canyon, the clouds enveloped us in a torrential downpour, turning to massive flakes of snow as we gained altitude to the canyon summit. For the next 75 miles we pressed on through the fringes of hypothermia, smiles frozen to our faces all the while in the happiest bit of misery one could experience. Finally making it to Price, Utah, we huddled in a gas station, trying to thaw our frozen limbs. We felt resilient and proud, but the daunting realization that we still had 100 miles to go before reaching our camp spot kept us from resting on our laurels too long. Layering up with everything dry we had packed, we rode out into the middle of the desert, guided by the stars and the beating hearts of the 701s beneath us, brothers-in-arms who overcame the worst weather Nature had in store, pushing on to the real prize, way out there. Riding up to our campsite and scaring away lingering cattle, we circled quickly for a level patch of dirt to call our home for the evening. “Home” never sounded so good after this opening day of adventure. Pitching our tent over the smoothest spot we could find, we fixed a campfire to warm our bones and settle into the kind of sleep you can only find outdoors. Josh fell asleep fireside; Aaron harnessed an inspired second wind and captured stunning long-exposure shots of the night sky over the campsite. Nestled in the hills of this wild desert, we were just a group of wanderers in search of the next frontier. As we lay in our tent, I couldn’t help but think we were in the same desert that Butch Cassidy and The Sundance Kid once ruled, hiding in the hills with loot they had just stolen. Waking up to the sound of raindrops bouncing off our tent had never been so disheartening. We listened as the rain seemingly crushed our dreams of riding that day. As the pounding rain stopped, we ripped the tent fly open and couldn’t believe what we saw. It looked like we woke up on the moon. The Utah desert was still absorbing the rainfall, popping, gurgling, and shifting as it ingested all the moisture. With a pastel desert backdrop, these huge gray hills, steep chutes, and perfect dirt were untouched, ready and freshly groomed by Mother Nature herself. This story was playing out exactly how we had envisioned it, and now it was time to take our mission to the next level. We picked a line up a mountainside that could have been decorated by Dr. Seuss and wasted no time getting to the top. Parking the motorcycles, we unloaded our mountain bikes, spotted our down lines, and it was on. Josh and I pulled on our helmets, threw up a fist bump, and yelled “Dropping!” to alert Aaron and Kollyn that it was time to speed the film: It’s getting real. In a dreamlike sequence, we released the brakes and tucked, ripping down a wide-open face, finding new lines in perfect chocolate-cake dirt with nobody around to witness. In that moment, grins wide and my best friends cheering, I realized that this was it; this was exactly the reason we set out on this adventure. I looked left to see my brother, Josh, side by side with me, carving matched lines down virgin dirt, each action unfolding seamlessly in slow motion into the next. Locked into a total state of flow, time dilates. Your actions lock into sync with others’. Your focus is in hyperdrive as your brain recruits every ounce of resources to the task at hand. It’s a magical, beautiful thing, on the verge of gaining superpowers. After carving up gorgeous faces like Thanksgiving dinner, my appetite shifted; I had to find a jump. Creativity pulsing at a level 10, I found a line near the top that set up perfectly to jump my mountain bike over my Husky 701. With no time to soak it all in, our fun was cut short as another round of downpours and flash flooding chased us out of the desert and back to the safety of the open road. Heading south, we hoped we could escape the rain and find some red rock and sand somewhere near Moab. Rolling into our second campsite, we narrowly beat the weather and hunkered down for the night. Still surprised that the storm had chased us this far, we were hoping for better luck in the morning. As the sun came out from behind heavy gray skies, we had to kick Josh out of bed to hunt for that perfect morning light. Eyes half open, we were back on the prowl, riding our 701s and looking for a new zone suitable for both motorcycle and mountain bike. After a few hours, we came across a massive natural arch carved from sandstone, formed over thousands of years of erosion. On the trail leading up to it, there was a fun downhill line ending at the top of the arch. Layers upon layers of sandstone mountain gave infinite depth to the shot and framed out a perfect stage for the action that was about to unfold. Perched on top of a 3-foot-wide sandstone bridge, with 60-foot drops on both sides, I couldn’t help but do a wheelie across the top. It was an incredible way to finish a mountain bike ride. While we were enjoying the awe of the natural wonder surrounding us, the rain had started once again, but this time with more intensity, each passing minute progressing from an inconvenience to a definite problem. In the desert, water moves at a rapid pace, and before our eyes, our exit trail turned from a stream into a small river—then our tracks were washed away entirely. Swallowing down the bitter tightness of panic in the midst of a life-threatening situation, we managed to navigate our way out of the deadly desert labyrinth back to high ground, defeated and retiring our tents once again. Wet and cold, we endured a brutal night only to wake up to the sun on our faces. The sun’s rays brought us back to life like butterflies emerging from their chrysalises—barely stirring at first, but soon peeking out from our tents with a smile at the weather having turned in our favor. Itching to find some red-rock riding for the moto, we left the mountain bikes at camp and set off for the sandstone dunes. Looking around and seeing red rock as far as the eye could see, we kept going. The farther we went, the more unbelievable the scenery got. Our theory proved correct: Beyond the roads and parking lots we access by car lies another world, pristine and rarely explored, in the natural folds of Utah’s vast landscape. Finishing our final day with a bang, we loaded up and started our trek home holding the unique satisfaction that comes with knowing you just broke new ground. When we began this mission, we had a hunch. And, like archaeologists, we started to dig in the face of doubt and emerged victorious, finding our prize and proving the theory undoubtedly true. The ride home was filled with thoughts of the next adventure—our new addiction that pairs man with our favorite forms of two-wheeled misadventure.